In a study conducted by the University of Michigan, it was found that nearly one in four visits to the emergency room for eye-related traumas could have been seen and treated by an eye doctor — which makes it clear that your first level of emergency eye care should come from your local Alexandria ophthalmologist. Eye care, especially when it’s an emergency, evokes fear and anxiety of the unknown. At Sina J. Sabet, our office and eye doctors seek to treat each patient as an individual and with empathetic and experienced care. Better navigate an eye care emergency and learn more about them in today’s blog. When you experience varying levels of acute discomfort in your eye(s), panic can set in because of the fear of losing sight — arguably one of our most important senses. Below are common eye traumas that warrant a visit to your local ophthalmologist. While pink eye may not be a serious eye emergency, we’re classifying it as one because of how contagious it can be. If you have a kiddo with pink and they go to school, it can quickly spread from student to student like wildfire. Pink eye causes inflammation in the white part of the eye, known as the conjunctiva and can be uncomfortable. A typical symptom of bacterial conjunctivitis is mucus that leaks from the infected eye. A burn to the eye is typically caused by a chemical burn from an alkaline or acidic substance and can cause damage within five minutes of contact. Just an accidental splash can result in eye pain, irritation, impaired vision, and issues opening the eye. If a chemical burn occurs immediately use an eyewash station (if one is available) and use the eyelid contractor to expose a majority of the eye and irritate your eye as much as possible. Be vigilant in washing your eye out and call for emergency eye care for an examination. Direct eye trauma can be experienced in sports such as tennis or lacrosse from getting a ball straight to the eye, or activities as paintball and rock climbing. 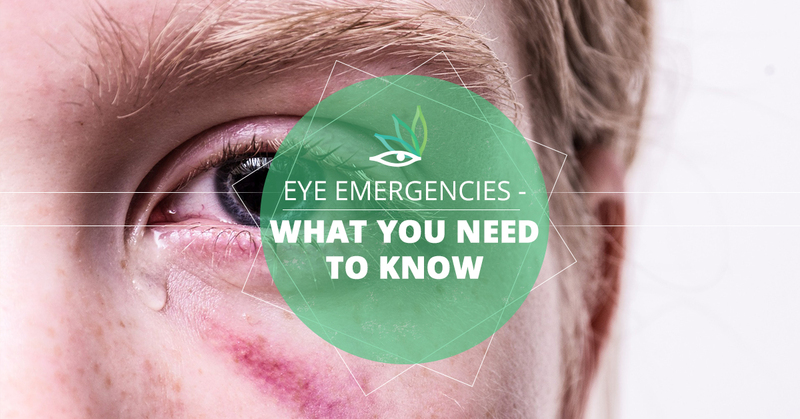 Eye trauma can result in a broken eye socket or a ruptured globe — these types of traumas need immediate attention. The most crucial thing is to get an evaluation by an eye doctor right away to prevent possible permanent vision loss. There are instances when we get both large and small foreign objects in our eyes. This can be anything as small as sawdust or glass shards, to nails and pencils. If the object is small enough, you may be able to remove it blinking or excessive tearing or rinsing it with water. If it is large, do not attempt to remove it. It’s imperative to see an ophthalmologist for treatment. Emergency eye care is an important service that treats conditions such as pink eye, chemical burns, eye trauma, and foreign objects. To connect with us about our emergency eye care services, call our office. To learn more about emergency eye care, you can reference this page.